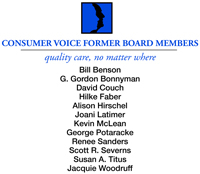 The Consumer Voice sincerely thanks each of our sponsors for support of the 35th Annual Meeting & Conference. Their support enables the Consumer Voice to keep registration fees affordable and offer scholarships to those who would otherwise be unable to attended. Interested in sponsoring the Consumer Voice Annual Conference? View our Sponsorship Kit.